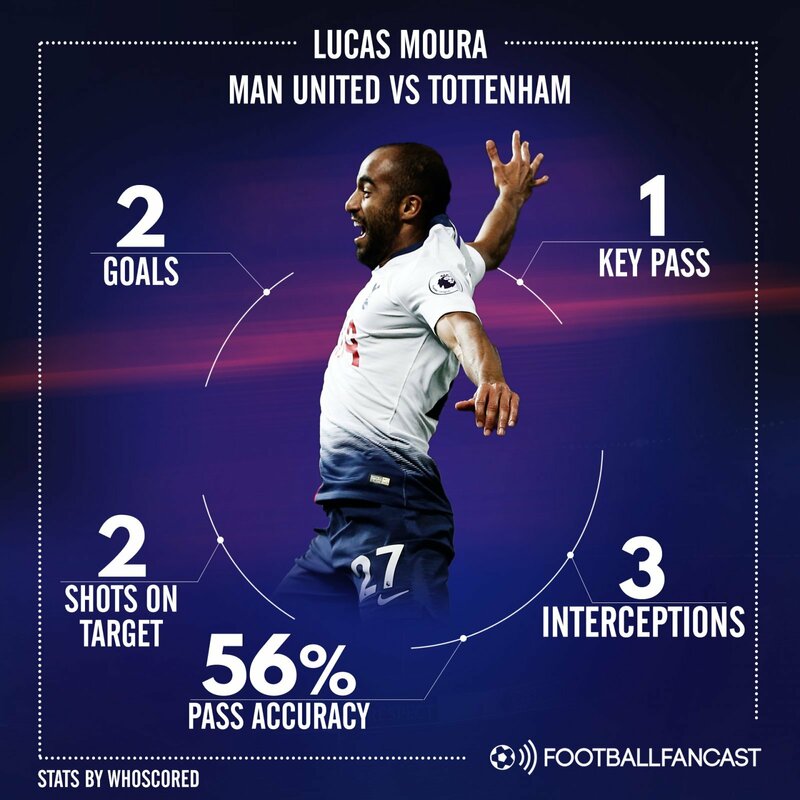 Tottenham fans are finally starting to see the true Lucas Moura, after the Brazilian netted twice in Spurs’ 3-0 win away at Old Trafford on Monday evening. Moura joined the North London club in January but failed to hit the ground running during the second half of last season, making just 11 appearances in all competitions, scoring one goal and providing four assists. This season however, the 26-year-old has had a full summer programme to impress boss Mauricio Pochettino and work his way into the starting line up for Premier League fixtures. He has also grasped the chance to replace Heung-min Son who is on international duty at the Asian Games with South Korea, which is certainly something that Spurs fans would have been worried about prior to the beginning of the season. Moura has started all three of Tottenham’s games so far this season and has become increasingly impressive. Playing up almost alongside Harry Kane on Monday in Manchester, the former Paris Saint-Germain man pressed the makeshift United back three of Phil Jones, Chris Smalling and Ander Herrera, making three interceptions in the process. In the first half, Moura’s pacy and direct running caused problems and could have won his side a penalty when Jones bundled him to the ground just inside the penalty area. The teams went in to the break at 0-0 though, but the Spurs man stepped it up in the second half and scored with both of his shots on target after Kane had given Pochettino’s men the lead. His first came as Christian Eriksen pulled the ball back towards the penalty spot and Moura beat Herrera to sweep the ball home. The Brazilian’s second and Tottenham’s third perhaps epitomised Moura’s performance as he received the ball just inside the United half and ran straight at Smalling. With the England defender all at sea, Moura breezed past his lacklustre tackle and fired into the corner of David de Gea’s net. The one part of Moura’s game that he still needs to improve on is his passing and ball retention. Against United he made 18 passes but just 55.6 per cent of these were successful. If he can work on this side of his game, Moura could become the match winner that Spurs have been missing since Gareth Bale left for Real Madrid in the summer of 2013.